Multifile Premium Plan Racks will hold all brands of plan clamps with our Multifile Premium Plan Clamps designed to fit into most plan racks currently on the market. Multifile’s Premium Plan Racks use a heavier gauge of steel with our racks weighing between 17-22 KGS each against others on the market which only weigh between 11-14KGS. The robustness of the Multifile Premium Clamp and Rack range translates to an increase in strength and integrity whilst being fully mobile. 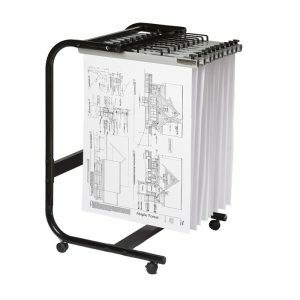 All Multifile Premium Plan Racks and Clamps come with a Lifetime Warranty.